It’s hard to believe it’s been nearly a decade since the death of Michael Jackson. His music influenced generations of musicians and earned him a global fanbase. With such dizzying levels of superstardom – and his very own back garden theme park – its easy to forget he was also a dad. His daughter Paris was just a child at the time of his death back in 2009. MJ was 50-years-old. Yet now, she’s now a super-stylish 20-year-old; working as an actor and model and it’s clear she’s never forgotten her famous father. Taking to Twitter mere days after her twentieth birthday, Paris tweeted a black and white picture of her being hugged from either side by both her parents. All three are beaming in the picture and for a moment, this appears to be a close family moment. However, on second glance its clear the un-captioned image is photoshopped. It shows Paris as an adult rather than the little girl she’d been when Michael was still alive. Furthermore, due to their bitter custody battle, it’s highly unlikely her father and mother, Debbie Rowe, would have posed together for a happy family portrait. No i think it’s nice to dream about what it would be like to have parents, and to have it put into something i can see, even if it’s a fan made edit. I love edits of you they like make you think of what could have been it’s like imagination really it makes me think of what my life could have been….interesting. That’s so nice that people make those for you, I’ve seen some great ones. Not like the real thing, I know, but still an awesome thing to see and it’s cool how you show appreciation for them. He would be proud of the great woman you have become. You were blessed to have had such a great father and inspiration to many around the world. He might be gone but his memories live on. i adore the Pic ?.. I wish your mama is well and very healthy and should feel very proud of her little star, she deserves and you too dear! God bless and always protect ♥ with a life full of love and happiness♥? Some fans even went as far as to show Paris some more edits depicting her hanging out with her dad. One piccy showed a young Michael looking over his daughter’s shoulder; both of them wearing similar blue jeans. Another emotional photograph showed them embracing and grinning into the camera at Paris’ birthday bash. 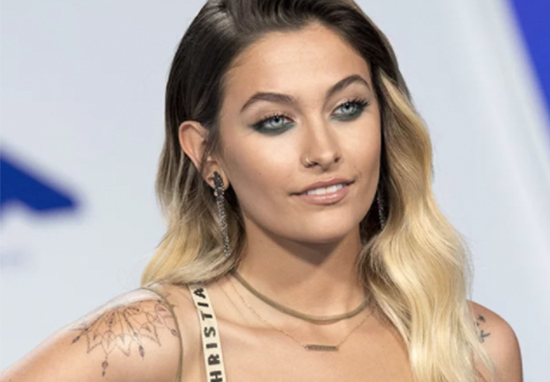 Whatever you may think of Paris’ tribute, if it can help her deal with her grief and keep her father’s memory alive then she deserves our full support. So going forward, anything bad that happens can’t be nearly as bad as what happened before. So I can handle it. Beautiful. Both are so proud of you. Michael is smiling watching over you ? If you’ve experienced a bereavement and would like to speak with someone in confidence contact Cruse Bereavement Care via their national helpline on 0808 808 1677.